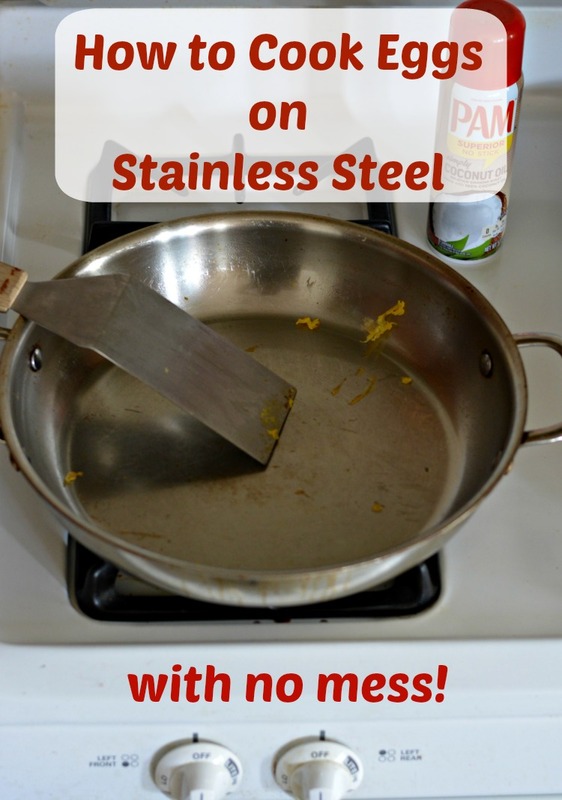 How to cook eggs in a stainless steel pan with no mess! 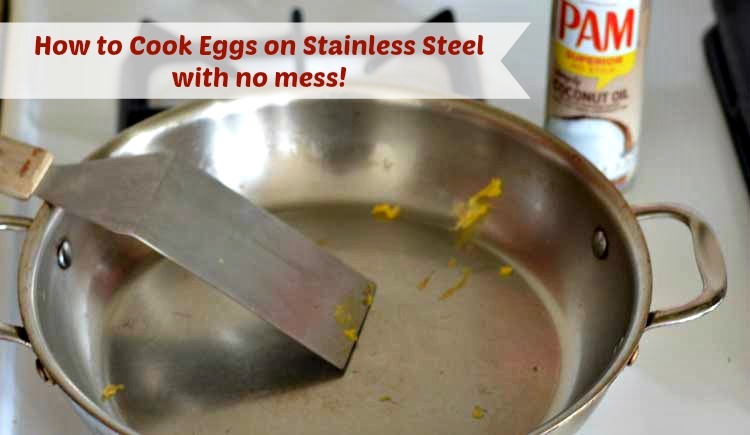 Say good-bye to egg residue with this quick and easy tip to get non-stick eggs in a stainless steel skillet. Years ago I replaced all my non-stick pans with stainless steel or cast iron pans. I had some concerns about the non-stick coating on the pans so out they went. For the most part switching to stainless steel and cast iron was pretty smooth and I found that I really enjoyed cooking with heavier pots and pans. They retain their heat better – and come in pretty colors! 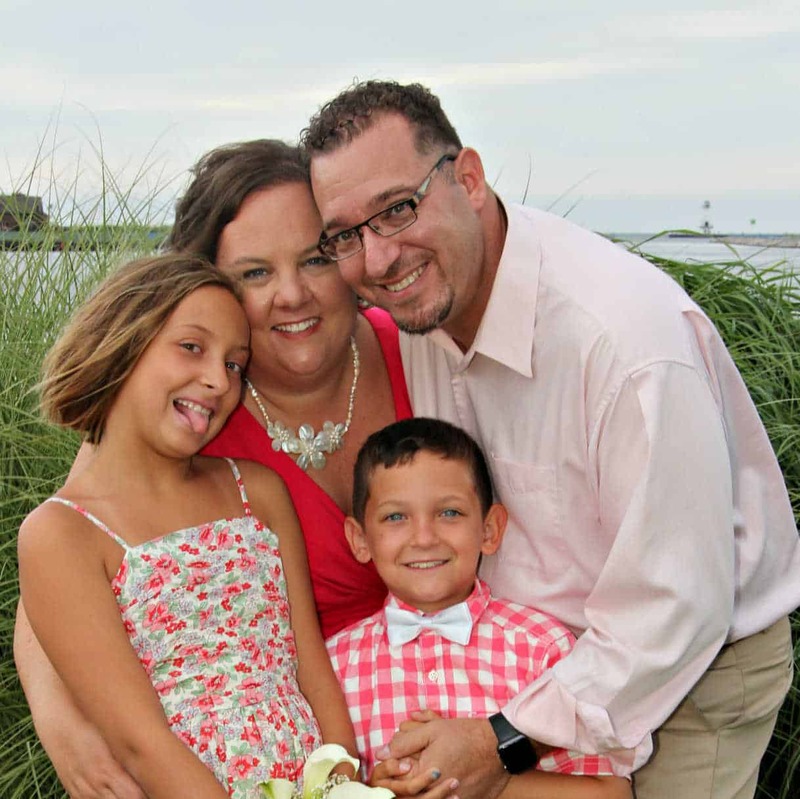 I purchased this large stainless steel frying pan and it has been a staple in my kitchen. 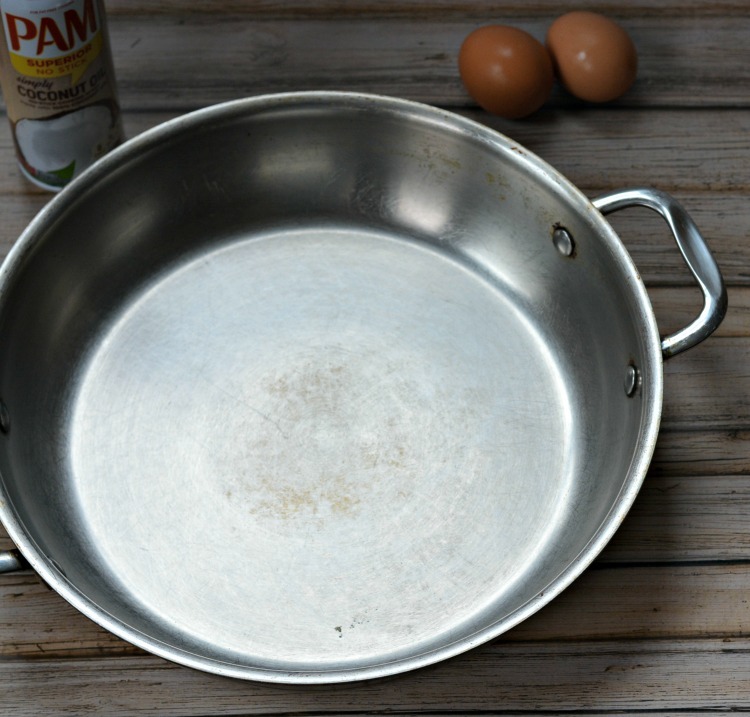 I use the pan at least once a day most of the time at breakfast to cook eggs. 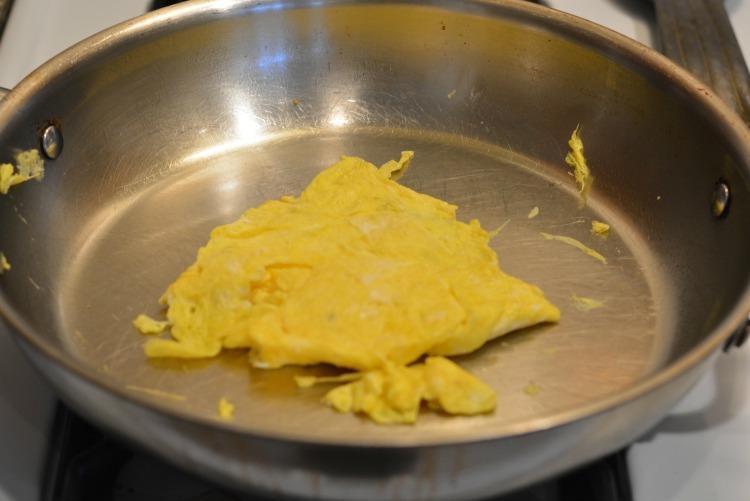 I spent months after purchasing the pan trying to figure out how to cook eggs in it without spending 15 minutes scraping off cooked on egg afterwards. I tried using more oil. I tried using just butter. I tried a combination of oil and butter. 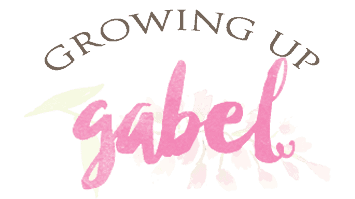 I tried different oils – nothing worked! Then one day I was in a rush and instead of letting the oil sit in the pan to get hot before putting in the eggs, I put the eggs in right on top of the oil. To my amazement, the eggs didn't stick! I'd solved the mystery of how to cook eggs in my stainless steel pan without leaving any egg residue. I've tried this trick with all kinds of different oils and even butter and it works every time. I've been using PAM Simple Coconut Oil lately and used it for this batch of eggs and it worked great. PAM says that it leaves 99% less residue, but I'd say it's closer to 100% less! 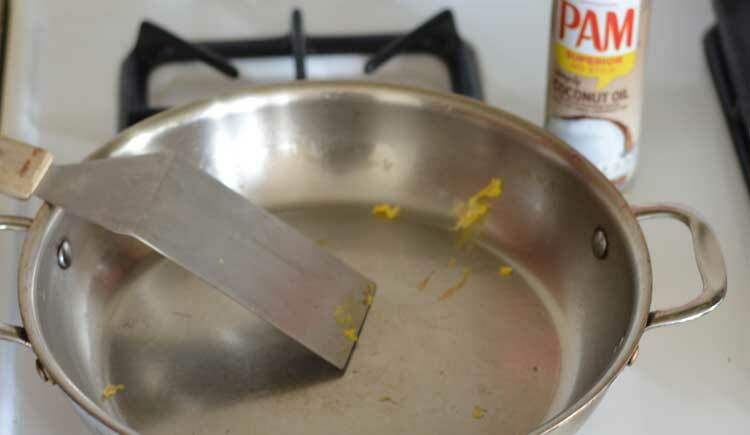 This trick seems to work best with fewer eggs – I still get a little residue when I'm cooking up a big batch of eggs, but not as much as before. Do you heat the pan before putting the oil and then the egg on top of the oil or is it all cold? I use Pam spray all the time. It does make a difference.